The Bombers remain committed to Foketi, despite his limited game reps. He spent the first nine games of the regular season on the reserve list, before starting two games — August 25th in Calgary and the Labour Day Classic a week later — when Jermarcus Hardrick was injured. Unfortunately, Foketi was injured in his second start and spent the rest of the year on the injured list. Spent the entire 2017 season on the club’s reserve list. Did not see any game action. 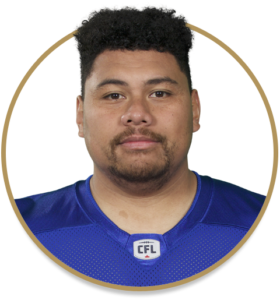 Played in three games as a first-year CFL player. Stepped into the lineup when Pat Neufeld and Sukh Chungh went on the injured list. Began his collegiate career at Mt. San Antonio College and in 2009 was named a Second Team All-Southern California Football Association All Star… His teams were a combined 15-3 during his time there and won a national championship in his sophomore season… Transferred to Kanas State in 2010 and started every game at left tackle, but missed most of 2011 with an Achilles heel injury… Then transferred to West Texas A&M where his finished his college career… Signed as an undrafted free agent with the Denver Broncos and spent parts of 2014 with the Buffalo Bills and New Orleans Saints.